A team from Cumberland School of Law recently made the final four of the National Trial Competition national finals in Houston, Texas. Over 325 teams participated in this competition at the regional level with the top two teams from each region winning the right to participate in the national finals. For the sixth time in seven years, Cumberland won the Southeast Regional. The team of Spenser Templeton and Matt Woodham defeated teams from American University Washington College of Law, Wake Forest University School of Law and Loyola Los Angeles School of Law before losing a 4-3 decision in the semi-final round to eventual national champion Chicago-Kent College of Law. Paige Duncan and Max Smith were also members of the team who provided invaluable contributions to the preparations for this competition. The team was coached by Judge Jim Roberts, Sara Williams and Ross Massey. This was the 40th anniversary of the National Trial Competition, the oldest and largest mock trial competition in the country. The NTC is sponsored by the Texas Young Lawyers Association and the American College of Trial Lawyers. As part of the celebration, the top 16 law schools based on number of appearances at the national finals over the past 40 years were invited to an event recognizing their success. As one of the top five schools in number of appearances at the national finals, Cumberland was honored to participate in this special celebration. 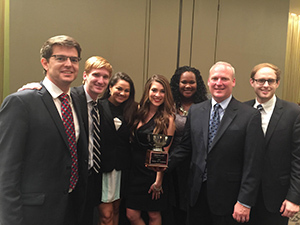 Photo Caption: (From Left to right) Ross Massey, Matt Woodham, Paige Duncan, Spenser Templeton, Sara Williams, Judge Roberts, and Max Smith celebrate winning the Southeast Regional title of the National Trial Competition national finals.